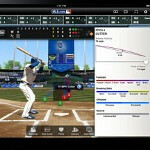 If you love baseball, one of the best apps for scores and highlights is At Bat 2011. At $14.99, it is also one of the costliest, but that price won't even buy you a decent seat in most ballparks these days. Those using an Apple iPod get the best that this app has to offer including free out of market games streamed to your tablet for April. But that doesn't mean that smartphone owners are shut out (pun intended). MLB.TV will broadcast a free out-of-market 'Game of the Day' throughout the season, for your viewing pleasure. In addition, key moments and turning points will be sent directly to your device via Live Look-Ins (no blackout restriction on these quickies) and of course, there is the ability to listen to the play-by-play call of every MLB game in progress. You even get to pick between the Home and Away radio crew. Another great feature is live up-to-date scores from around the AL and NL including the batter, pitcher, current count, runners on base (if any). While a game is in progress, video highlights become available (we would suggest watching those on Wi-Fi). For Android owners, there is a list of handsets that support live video at the source link. Android 2.1 or higher is required for the app, which can be downloaded from the Android Market. Owners of BlackBerry models running OS 5.0 or higher can grab a version of At Bat 2011 that does not have all of the features available for the iOS and Android versions, from BlackBerry App World. iOS users can pick up At Bat 2011 from the App Store. One last note. If you are a subscriber to MLB.TV, Android and iOS users can gain access to their account via their handset. It looks like an exciting baseball season is starting. Anyone want to go out on a limb and give us their World Series winner for 2011? Just head over to the comments box below and leave us with your pick. Just downloaded the app this morning. Watched a few highlights from yesterdays' games and streamed the Phillies v. Astros game on the way to work. Loving it. Highly recommended app for baseball fans.